A giant beautiful jar. On the right is my laundry soap crock, and this one matches perfectly. It is 2 gallons or larger and cost $10. Stray socks? A triple batch of laundry soap? Maybe I’ll store yarn in it. Oh, please, provide the laundry soap recipe again? Mix 1/3 bar grated Fels Naptha soap into 1.5qts very hot water til dissolved. Add 1/2 cup Arm,&Hammer super washing soda and 1/2 cup borax and mix well. Add 1qt hot water. Solidifies overnight and stays kind of separated when stirred. Use 2-3 Tbsp/load. 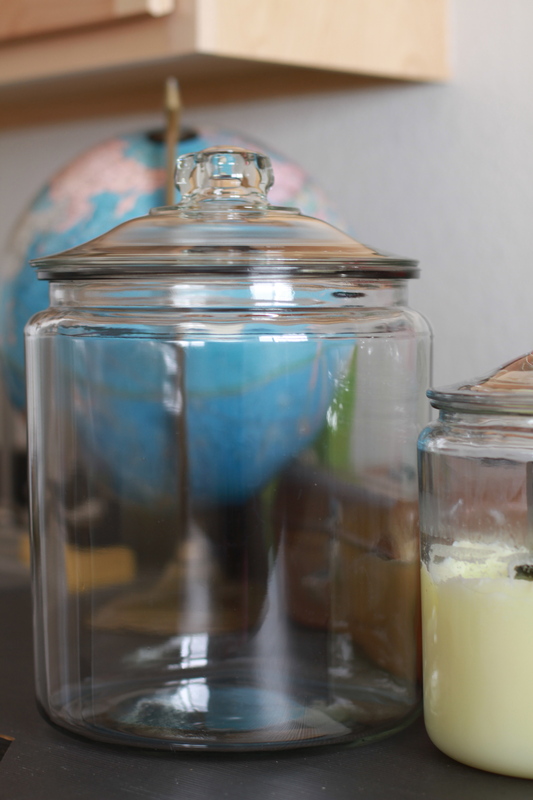 You are currently reading Apothecary jar at whatsarahfound.